The Standing Rock Nation covers 2.3 million acres and is the fifth largest land base reservation in the United States. It receives its name from a natural rock formation that resembles a woman with a child on her back which currently stands on a monument outside of Tribal Headquarters. The physical geography of the reservation itself is one that stretches over expansive tall grass plains, rolling hills, and buttes that border the Missouri River. Other bodies of water inside reservation boundaries are: Lake Oahe in Eastern Standing Rock, the Cannon Ball River in the Northern part of the nation, and the Grand River in the Southern part. Standing Rock is the second reservation to cross dual state borders, these states are North and South Dakota. Standing Rock is the home of the Lakota, and Dakota Nations that comprised the Oceti Sakowin or the Seven Council Fires. The two Bands that come from Lakota Nation are: Hunkpapa which translate to “campers at the Horn” and Sihasapa which translate to Blackfeet. The Dakota people of Standing Rock include the Upper Yanktonai or called the Ihanktonwana which translate to “little end villages” and also called Wiceyala. The Lower Yanktonai called Hunkatina and the Pabaska means Cut Head Band. The Cut Heads, whose name is literally translated, get their title from, the fact that when they withdrew from the Sissetonwan. Their leader sustained a scalp wound and the name Cut Head was given. The Hunkpapa and Blackfeet people were known as the horsemen of the plains and primarily hunted buffalo for all their needs. When the Middle Sioux moved onto the prairie they had contact with the semisedentary riverine tribes such as the Mandan, Hidatsa, and Arikara. and Ihunktonwan. The Yanktonai were a river-plains people who did some farming as well as buffalo hunting. The languages spoken on Standing Rock are based on two of the three dialects, “L” meaning Lakota, and “D” meaning Dakota.. The Lakota and Dakota Dialects are used on Standing Rock today. Standing Rock is known for being the birthplace of one of the most widely recognized Native American historical figures: Sitting Bull. Known in his own language as Tatanka Iyotake, Sitting Bull was a Itancan or Leader of the people. He was born along the Grand River and lived the traditional lifestyle of his people. In his lifetime, he fought to preserve and protect the ways of the people and stood firm against all attempts by the U.S. government to buy land sacred to the Lakota/Dakota people and to being relocated to the reservation set aside for the nation. Sitting Bull was killed in an attempt to arrest him on December 15, 1890. There are two burial sites for Sitting Bull, one located in Fort Yates North Dakota which is the original grave site. The first grave has a rock and bronze sign on Sitting Bull. The second burial is located across the river from Mobridge South Dakota where the grave was supposedly removed to in 1953. A site a bust in his honor, carved by Korzcak Ziolkowski, overlooks the west bank of the Missouri River on the eastern boundary of the reservation. Standing Rock participated in the Battle at Little Big Horn on June 26, 1876 where they took the United States flag in Battle. Today June 25this a tribal holiday where we honor our warriors who fought in this great battle. In addition to its rich culture and history, Standing Rock offers great scenic drives and recreational opportunities. The National Native American Scenic Byway runs along historic Highway 1806 and Highway 24 for 86 miles crossing the lands of the Lakota and Dakota people, who preserve the history of several explorers, trappers and chiefs who were essential in the shaping of the American west. Memorial markers, Interpretative signs and monuments commemorate the heritage of the Lakota and Dakota nation and allow visitors to hear history from the Native American point of view along with the early settlers. The Lewis and Clark Legacy Nature Trail, located at Prairie Knight Marina, is a three mile walking/biking/hiking trail with markers identifying natural plants, including explanations of how the Lakota and Dakota used them and the wildlife of the area. Standing Rock offers fishing, boating and other water recreation on Lake Oahe. The Bay, located in Indian Memorial Recreation Area near Grand River Casino and Resort, near Mobridge, and Prairie Knights Marina, near Fort Yates, provide RV hookups, camping areas and ample space for boating and fishing. Standing Rock also offers historic step on guided tours though the Scenic Byway. Hear about the life of Sitting Bull, Gall, Two Gun Hart, Moustache Maude, Hugh Glass, Jim Bridger and Jedediah Smith as they made history on Standing Rock. The Sitting Bull Visitor Center is open and offers classes on traditional art work, the visitor center also holds a few picture and art from the Standing Rock Water Protector Movement. 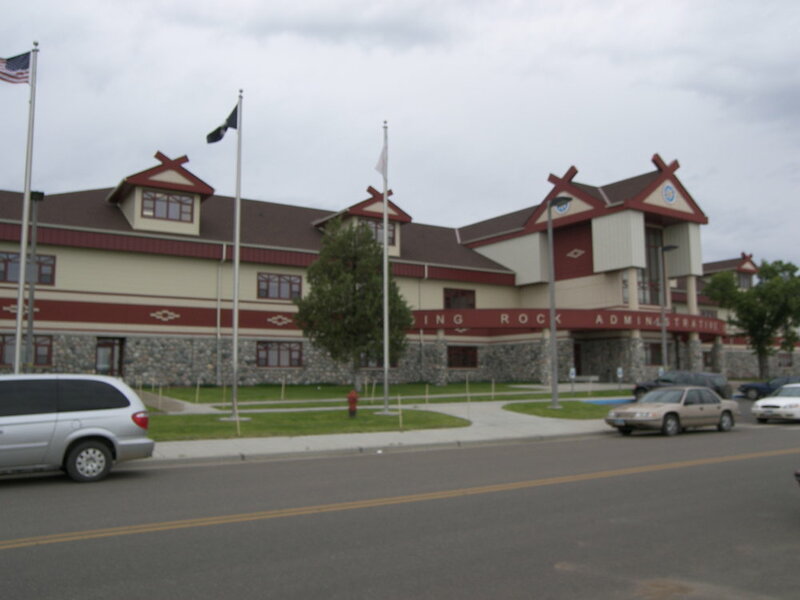 Standing Rock has though out the year many events like rodeos, horse ride, horse races, wagon train rides, bull riding, wacipi/pow-wows and other events that the visitor would enjoy.